All the while, regardless of what President Trump claims, Kim never promised to abolish North Korea’s nuclear weapons. To the contrary, in a show of confidence, Kim declared in the spring of 2018 that having successfully created a nuclear deterrent, the state would turn attention to economic development, the second “leg” of the two-pronged Byungjin, dual-track strategy. During a year when Kim has perhaps talked more and more openly about economic policy change than any of his predecessors, it isn’t surprising that many compare — often with a great deal of hope and anticipation — today’s North Korea with China just prior to its “Reform and Opening,” an economic reform policy started by Deng Xiaoping in 1978, and wait for Kim to announce a change of course. And yet, the year saw no major announcement of a policy change. North Korea’s leader announcing a “focus” on the economy, after all, bears few direct policy implications. North Korea, however, is not China, and history teaches us something important about the rationale for leaders in announcing systemic overhauls and political breaks. Consider the historical backdrop, geopolitical mentality, and position of China in the 1970s. Between 1838 and 1949, the official, propagandized narrative of the Chinese Communist Party goes, the country experienced a “century of humiliation.” The country was defeated by Great Britain in the First Opium War (1839–1842), followed by the oft-called “unequal treaties.” These treaties created conditions of trade between China and a number of major world powers — the West and Japan — widely considered unfair, unequal, and unfavorable to China. For a naval power whose superiority used to be largely undisputed, and a country regarding itself as the center of the planet given its unparalleled military strength and vast size, these were massively difficult pills to swallow. Chiang Kai-shek declared the century over with the defeat of the Japanese Empire at the end of World War II in 1945, and Mao Zedong did so with his victory in the civil war and declaration of the People’s Republic of China in 1949. China, however, did not immediately return to the status of the great power it once was. Decades of Maoist chaos, famine caused by the Great Leap Forward (1958–1962), and near-civil war with the Cultural Revolution (1966–1976) left the Chinese economy in shambles and its international standing weak as a result of decades of disarray and poverty. After Mao’s death, therefore, the national imperative was to put China on track toward economic prosperity, and begin returning to the international power, standing, and strength it once had. It is often much clearer after the fact how a country and its leadership perceive their place in history. Still, the urgency under which China’s leadership instigated the process of “Reform and Opening” simply doesn’t seem to be there for North Korea and Kim Jong Un when it comes to the economy. To be sure, the Korean Peninsula is by no means immune from the pressures of history. The late 1800s, and the last few years of the Choson Dynasty (1392–1910), saw the birth of a political divide between inward-looking conservatism and (often pro-Japanese), outward-looking progressivism and modernization with a strong sense of urgency and fear of falling behind the rest of the region. The remnants of these historical divides — of course, explained here in a grossly simplified manner — are visible still in some aspects of Korean politics. But North Korea is primarily influenced by different traditions. Most of the founders of the regime spent their formative years outside of Korea. As Adrian Buzo has articulated eloquently and convincingly through the narrative of the Guerrilla Dynasty, North Korea’s political trajectory began first and foremost with the guerrilla war environment of northeastern China (Manchuria). There, the state’s founder, Kim Il Sung (1912–1994), fought in a rugged, dangerous, paranoid environment against the Japanese Empire, and several more of the state’s founding individuals were guerrilla soldiers, too. 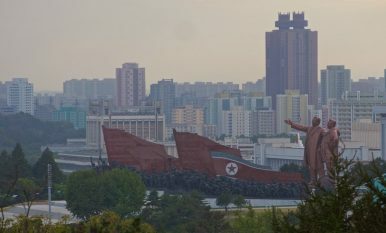 North Korean propaganda paints a wildly exaggerated picture of Kim’s endeavors, one that in large part has little to do with the historical reality. One should always be careful not to overinterpret the influence of history on present-day politics. Nonetheless, it is difficult to deny that the formative experiences of many of North Korea’s founders came to play a crucial role for the country’s political ideology and ambitions, not least when it comes to the desire for a nuclear deterrent. In a way, Kim Jong Un has already fulfilled North Korea’s historical imperative. By officially declaring in the spring of 2018 that the country now has a nuclear deterrent capable of striking the continental United States, Kim closed the book — or so he would argue — of a long-standing ambition of the country’s leadership: to produce a credible and deliverable nuclear weapon. That is not to say that economic prosperity and industrial strength aren’t important to Kim. He has shown both in word and in deed that it is, by promising economic prosperity and higher living standards for the general public, and though relatively little has still been delivered, he has arguably already done far more for economic improvement than his father, Kim Jong Il, ever did. Kim Jong Un has cracked down on smuggling and foreign media sales on the country’s markets, but also institutionalized the market system and let it expand. Still, it is important to remember that North Korea has a logic of its own. We shouldn’t assume that a sweeping, broad economic reform process is as urgent for today’s North Korean leadership as it was for late 1970s China, nor that it will look the same should it one day happen. From his own perspective, Kim Jong Un already has much to be proud of from his years in power. This piece was originally published by the Foreign Policy Research Institute (FPRI). Benjamin Katzeff Silberstein is an Associate Scholar with the Foreign Policy Research Institute, focusing primarily on the Korean Peninsula and East Asian region. Continued economic opening would be a boon for the North Korean people. The US should push Kim in that direction. Why North Korea Can't Follow in Vietnam's FootstepsSteering North Korea to Become a Normal CountryThe US-North Korea Summit: All Flash, Little SubstanceNorth Korea Far From Following VietnamA Generational Shift in Pyongyang: Is Change Ahead?